Russian metals and mining industry underestimated the depth of global economic problems of 2012, however, the companies did not expect any miracle in 2013 and started optimizing their spending, or reducing production volumes. The unfavorable market conditions failed to paralyze a flow of assets last year. The most anticipated event on the market was an initial public offering (IPO) of diamond mining giant ALROSA on the Moscow Exchange. The offering attracted a wide range of investors from various countries, and the entire stake offered was sold. “ALROSA IPO became quite a significant event on the market. The company boosted its free float and gained possibility to be included into the MSCI index. The diamond market currently attracts investor attention, because the market may face a serious deficit in the nearest future,” said Renaissance Capital Analyst Boris Krasnojenov. The most successful deal was billionaire businessman Mikhail Prokhorov’s sale of his majority stake in gold producer Polyus Gold International for U.S. $3.6 billion in the beginning of the year, which was before the major drop in gold price. At the same time, the Russian government again did not decide to hold a tender for a license for the development of large gold deposit Sukhoi Log. However, the current gold prices does not favor it, because the gold content in the deposit’s ore is low and mining operations will be unprofitable despite large gold reserves. 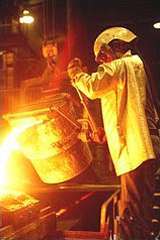 After the serious macroeconomic problems put pressure on metallurgy companies in 2012, the companies hoped for recovery in 2013, but they were wrong. The demand from Europe and China remained unstable. Decreasing prices for commodities lead to optimization as major trend of the past year among Russian and foreign companies. Previous years’ experience helped companies find the right way to manage their spending. “All tried to survive, optimize costs, but Severstal and NLMK made it better (than other Russian companies),” said BFA Bank Analyst Yulia Oniximova. Most analysts named metals giant Norilsk Nickel as the company of the year. The giant began the year with the new shareholder agreement, ending controversy, and managed to achieve good results. Under the management of its major shareholder Vladimir Potanin, the company keeps the position of the most profitable nickel producer and the number one nickel producer in the world. Investcafe Analyst Andrei Shenk said that the company’s dividend profitability was positive despite a 6% decrease in market value by the end of the year and a 18.8% drop in nickel price to $14,300 per tonne. Krasnojenov from Renaissance Capital added that the company demonstrated a significant progress in cost control with the new management. In the aluminum and steel industries, the companies, namely RUSAL, NLMK and Severstal, started solving their problems by cutting production volumes. Severstal’s major shareholder Alexei Mordashov called on global producers to consider cutting production volumes in order to remain profitable, but his efforts were in vain. One of the analysts named Mechel as a “zombie company”. The problems of the company, whose fundamental value is estimated as zero, still cannot be solved by government, or the owners. The company remained under pressure of its large debt burden for one more year and continues losing market value. The company’s stock price was falling throughout the year amid unfavorable coal market conditions. By the end of the 2013, the share price sharply dropped 40% more amid rumors that the company failed to agree with its creditors. In fact, the company managed to agree on new covenant holidays for one more year and extend debt repayments. “The company completed a program to sell non-core assets within a year after selling loss-making steel assets in Romania, Ukraine’s Donetsk Electrometallurgy Plant, power assets in Bulgaria, and ferroalloy assets in Kazakhstan and Russia. We consider that a range of companies in the industry should take such an experience into account,” said Krasnojenov from Renaissance Capital. “The market value has shrunk by 68.6% from the beginning of 2013. At the same time, the company managed to agree on covenant holidays with almost all creditors, restructured its short-term debt and agreed with (state controlled Vnesheconombank) VEB on financing the Elga coal project. Even Russian President Vladimir Putting named Mechel as a “not bad” company,” Shenk from Investcafe resumed. As a result, nothing is lost for Mechel, and if the coal market recovers, the company will be able to solve its problems. In particular, after the Fukushima accident in Japan, global attitude to nuclear energy worsened, and scientists consider coal as a future alternative. The year 2013 has become one of the most painful for investors, who considered gold as a “safe harbor,” as well as for gold mining companies, which lost from 50% to 90% of their market values. The gold price is now close to its fair value, experts said. “In 2013, investors realized that the market faces a unique paradigm. Despite a monetary policy of quantitative easing in the U.S. and more than three-fold expansion of balance, we saw a strengthening of the U.S. dollar, but not a weakening,” said Krasnojenov from Renaissance Capital. He said that investors chose gold amid inflation expectations, but the deflation scenario developed. In comparison with many other metals, about 40% of gold is used in the investment purposes, as an anti-inflation protection measure, while 50% is used in the jewelry industry, which is also commonly used as an investment tool. “Taking into account the tapering of stimulus measures by the Federal Reserve System in 2014 and a possible growth of interest rates in the U.S., the U.S. dollar will continue to strengthen, which undermines further decrease in inflation expectations and in gold demand. Gold price may decrease to lower levels in 2014,” he added. On January 12, the Indonesian government introduced a ban on ore exports, which is expected to significantly affect the companies and the market as a whole this year.